Entry in the Schedule of Monuments compiled and maintained by the Secretary of State under Section 1 of the Ancient Monuments and Archaeological Areas Act 1979 as amended. The monument includes a sequence of Roman forts at Castle Shaw, together with the remains of a settlement outside the ramparts of the forts and a section of Roman road leading to the forts from the south west. The forts and the remains of a civilian settlement have been extensively excavated over the last 100 years. The first fort on the site was an Agricolan period fort, built in turf and timber c.AD 79. This was refurbished soon after construction and then abandoned c.AD 95. Within the south eastern half of the fort, a fortlet was constructed, also in turf and timber, c.AD 105. This was redeveloped during its brief occupation and then sleighted and abandoned c.AD 125. Both military sites were constructed on a spur of higher ground, known as Castle Hill, overlooking the Castleshaw Valley. Through the valley runs the Roman road from Chester to York and the forts were built to defend and patrol the road in this section as it approaches the western Pennines. The original fort had two ditches outside a rampart enclosing an area 115m by 100m orientated north east to south west. Within this enclosure were the 'principia' (the administrative centre), the 'praetorium' (the officer's quarters), barracks and granaries. The fortlet, although on the site of the original fort, had two ditches and a rampart of its own and enclosed an area 50m by 40m with barracks, workshops and a large granary. The south east side of these defences has been cut off by a later medieval trackway called Drycroft Lane which runs in a cutting for 150m along that side of the forts and then heads south west towards Castle Hill Cote. Outside the ramparts, on the south east side of the fortlet, are the buried remains of a settlement which date to the period of the occupation of the fortlet c.AD 100. This occupies an area 90m long on the edge of the hill shoulder. These remains were discovered by trial excavation in 1995 and show that there was a possible 'vicus' or civilian settlement which had grown up with the occupation of the fortlet. Extra-mural settlement of this kind is likely to have included a bath house. This is expected to have lain to the south of the forts on the bank of the stream known as Waters Clough. There have been a number of excavations of this site to establish the nature of the internal buildings of the fort and the fortlet and the sequence of building and abandonment. Excavations published in 1908 and 1911 and interpreted by I. A. Richmond in 1925 have provided information about the sequence of buildings and their dates. Further excavations from 1957 to 1964 have defined the position and function of many of the buildings in the interior. The fort and fortlet were extensively re-excavated from 1984 to 1988 and a programme of restoration of the fort remains was completed in 1989. Further exploration of areas outside the forts was carried out during 1995 and 1996. In spite of all the archaeological activity on the site, there will be important and significant remains of the Roman military settlement left undisturbed. Earthwork remains of the Roman road leading towards the fort survive 50m to the south east of Castle Hill. A trackway with a shallow bank on either side can be traced for 120m before being lost in the ploughsoil of the field to the south of the forts. This was part of the road from Chester to York and another section is visible running north east from Castle Shaw Farm. The relationship to the forts is not yet clear, but there will be evidence preserved below ground. The remains of a textile mill, which was powered by the stream which ran through Waters Clough, survive 200m to the south of the forts. These are visible as earthworks in a marshy platform immediately above the stream bank. These works were active during the early 18th century. All post and wire fences and display boards are excluded from the scheduling, although the ground beneath these features is included. Roman forts served as permanent bases for auxiliary units of the Roman Army. In outline, they were straight sided rectangular enclosures with rounded corners, defined by a single rampart of turf, puddled clay or earth with one or more outer ditches. Some forts had separately defended, subsidiary enclosures or annexes, allowing additional storage space or for the accommodation of troops and convoys in transit. Although built and used throughout the Roman period, the majority of forts were constructed between the mid first and mid second centuries AD. Some were only used for short periods of time but others were occupied for extended periods on a more or less permanent basis. In the earlier forts, timber was used for gateways, towers and breastworks. From the beginning of the second century AD, there was a gradual replacement of timber with stone. Roman forts are rare nationally and are extremely rare south of the Severn Trent line. As one of a small group of Roman military monuments, which are important in representing army strategy and therefore government policy, forts are of particular significance to our understanding of the period. All Roman forts with surviving archaeological potential are considered to be nationally important. Roman fortlets are small rectangular enclosures with rounded corners defended by ramparts and ditches. They were constructed from the first century AD to the later fourth century to provide accommodation for troops who were attached to a fort in the same region. Their function was to guard strategic points on lines of communication or to supply outlying military stations. Only about 50 examples are known nationally. 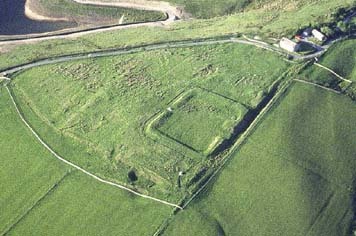 The Roman fort at Castle Shaw and the fortlet survive reasonably well despite the damage caused by later land use and a number of archaeological excavations. They provide an important insight into early Roman strategy and the arrangements for patrols along this stage of the trans-Pennine road. They will provide important information on the early occupation of the north of England. Further information on the relationship of the forts to the road will be preserved as well as information about the scope and nature of the civilian settlement attached to the forts. The site of the monument is shown outlined in red on the map extract. Authorised by: A R Middleton on behalf of the Secretary of State for Culture, Media and Sport under batch no: 10376.